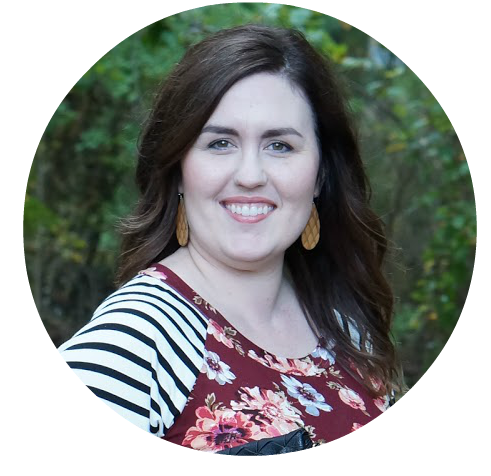 I have used my Stitch Fix referral link within this Stitch Fix outfits post. If you click through and schedule a fix, you will receive a $25 credit & so will I! That means, you get clothes and a credit & I get a credit. It’s win-win-win! Following after my last box of blazers, I requested a box of neutral spring cardigans. I absolutely love cardigans (and sweaters, in general), so I was sure to love a few items that my favorite stylist sent me. Make sure to tell me which one is your favorite! This cardigan was oh, so soft. It was kind of thick for a spring cardigan, but I actually wanted to snuggle up with it since our weather has been on the cooler side! This color is so cute but not quite what I had in my mind for my wardrobe. So, although it was super comfy and soft, I sent it back to Stitch Fix. Now, you might be thinking after that first cardigan that this color would also be nixed from my wardrobe. But, you would be wrong. I love the depth of this gorgeous blue, so it had to be added to my wardrobe. The material was soft and slightly thin but not in a bad way. This was a keeper! My stylist really knows what I like! So much so that sent me a cardigan that was very, very similar to one that I already own. 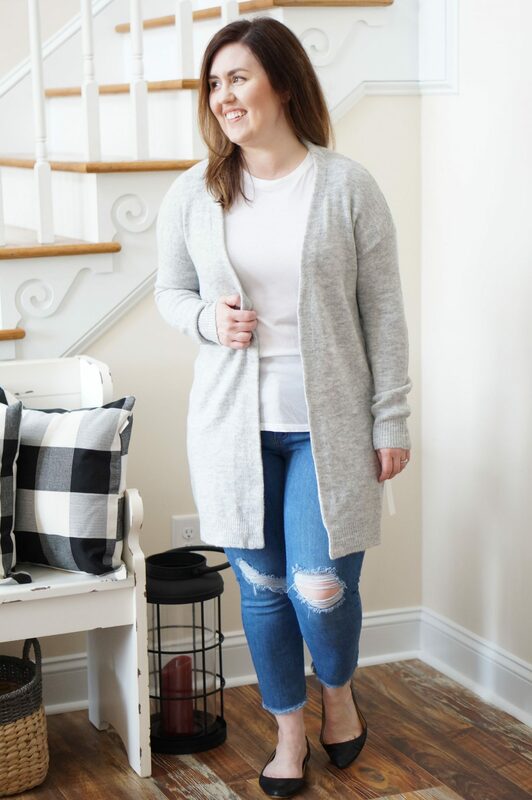 This classic style, grey cardigan should be a staple in all wardrobes, and especially the wardrobe of someone who wears cardigans all the time (me!). Sadly, I already have a cardigan like this. Even more sadly, I realized after sending this back that I actually like this one more than the cardigan I already have! 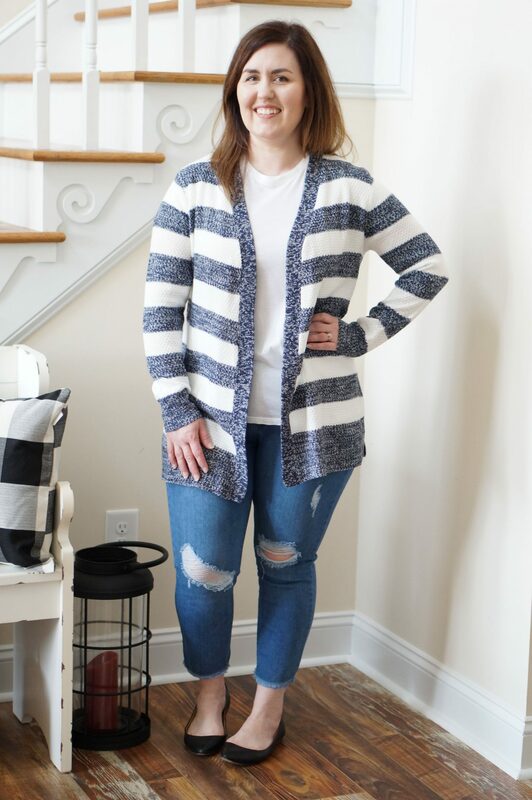 As a fan of a cardigan and stripes, this should have been a home run piece for me. Sadly, it was not. I love the wide blue and cream stripes. Incidentally, blue and white is one of my favorite color combinations. There’s something so fresh about it that makes it perfect for spring and summer. This cardigan just didn’t mix and match well with my current wardrobe. Thus, I sent it back to Stitch Fix. Now, friends, I just might have saved the best for last. This cream and white striped cardigan was right up my alley. I love the soft colors and the literally soft fabric. The button details are so cute. They are simply that — details, as they don’t actually unbutton. This will definitely look cute for a tank during the spring and summer. In case you couldn’t already tell, I kept this one! Which cardigan was your favorite?